Pregnancy is one of the most enjoyable times in a woman’s life and avoiding mental and physical stress is essential to prevent complications during delivery. Common complications of constant anxiety during pregnancy can include increasing blood pressure that causes dangerous headaches. Not only does a pregnant woman feel worse each day when experiencing stress, but the developing infant is often affected. The negative effects of stress can lead to premature births or infants with low birth weights, both of which may contribute to physical disabilities or learning difficulties in the future. Pregnant women can avoid the dangers of stress for themselves and their infant by finding ways to relieve feelings of anxiety. The emotional stress that occurs during each stage of pregnancy can affect the development of the embryo and fetus, leading to changes in vital structures such as the lungs, heart and brain. The effects of stress on infants may be noticeable at birth and several years later as a child begins to grow. In addition to low birth weight, birth defects and premature labor, a woman undergoing stress throughout her pregnancy is more likely to suffer from postpartum depression. Constant stress and anxiety during pregnancy can lead to an expectant mother failing to consume a healthy diet or engaging in daily exercise. Alternatively, postpartum depression that occurs right after or within a few months of giving birth can lead to a distorted mental state which may be dangerous for both mother and infant. While anyone can experience stress, it is vitally important to find ways to reduce feelings of anxiety to avoid developing health conditions such as heart palpitations or acid reflux, especially while pregnant. Pregnant women can find enjoyable ways to relieve stress experienced at home or work to feel better immediately and throughout a pregnancy to avoid early labor or fetal complications. One of the easiest ways to relieve stress is with exercise, but talk to a physician about this first. For women who are physically fit already, a physician may permit continuing strenuous exercise such as running as long as there are no complications. Of course, when a physician is concerned about a fetus, they may suggest milder forms of movement such as yoga stretches or swimming. Eating healthy foods for meals and snacks can improve mental and physical well-being. Pregnancy is not the time to go on any crash diets to lose or maintain weight. At the same time, a pregnant woman should not gain too much weight to avoid developing joint problems or diabetes. A physician will probably recommend a dietary supplement that contains nutrients essential for fetal development such as folic acid that reduces the chances of spinal abnormalities in infants. Prenatal vitamins contain additional nutrients designed to build strong bone tissue in fetuses while preventing loss of bone in pregnant women. A woman with food allergies may need additional vitamins but should discuss this with a physician first. Consuming a variety of foods, including vegetables and fruit can help to keep pregnant women from feeling tired to avoid emotional stress. 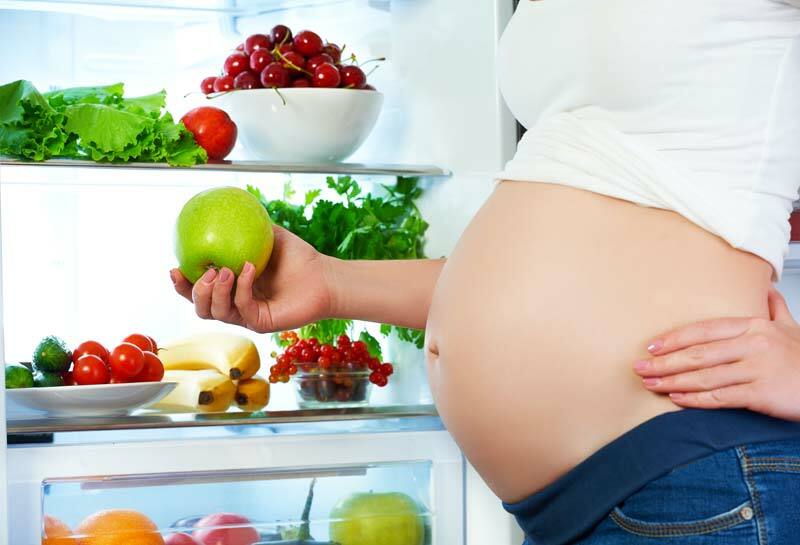 Additional foods to eat daily throughout a pregnancy are lean proteins, dairy products and whole grains. Taking time to meditate or practice spiritually can help pregnant women to feel less anxious. During pregnancy, a woman’s body changes rapidly as the fetus grows and her hormones fluctuate. Taking time throughout the day to focus on positive thinking can help maintain healthy thoughts. Other pregnant women want to focus on their spirituality during pregnancy by attending more services at a religious institution or attending prayer meetings. Going to religious services is also an excellent way to socialize with others to improve mental well-being. Some women reach out to other pregnant women or new mothers during their pregnancies to build a support group that is important after baby is born. A trip to a day spa can relieve the stress that pregnant women experience on a daily basis. Avoid any adverse complications by talking to an aesthetician about the most appropriate and safe treatments available for pregnant women at a day spa. Most experts advise pregnant women to avoid sauna or cold bath treatments due to the drastic changes in body temperature, but there are other treatments available at a spa. For a pregnant woman experiencing swollen feet, a soothing footbath, foot massage and pedicure is a good idea. As a woman progresses in her pregnancy, a back massage with essential oil applications can relieve her back pain and mental stress.